Our Lady Help of Christians, Tile Cross, Birmingham. Richard Gilbert Scott, 1967. Roof Detail, Our Lady Help of Christians, Tile Cross, Birmingham. Richard Gilbert Scott, 1967. St Thomas More, Sheldon. Richard Gilbert Scott, 1969. Photo: Lou Robson. 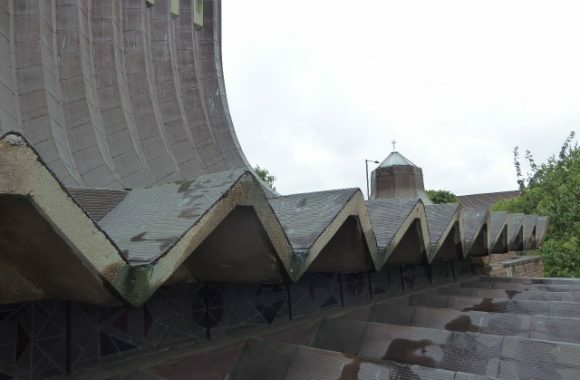 Join C20 West Midlands to view recent and on-going conservation works at two modern Catholic Birmingham Churches, both designed by Richard Gilbert Scott (1923-2017). 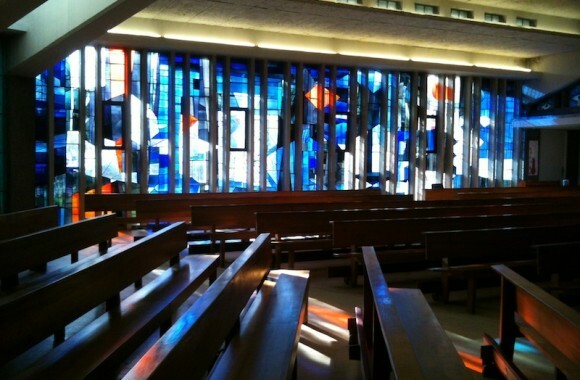 The first is the Church of St Thomas More, Sheldon, built in 1968-9 with stained glass windows by John Chrestien. It has a reinforced concrete frame and a fan-shaped roof. Recent concrete repairs have been carried out and were quite challenging. 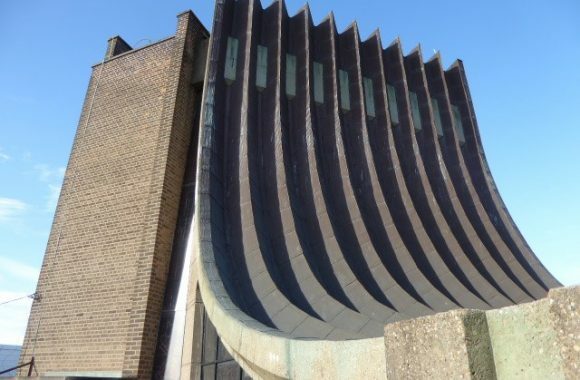 This will be followed by a tour of the Church of Our Lady Help of Christians at Tile Cross, (some know it as Kitts Green), which was built in 1966-67, with windows by Chrestien too. Here the stunning sweeping ribbed roof is being re-covered. 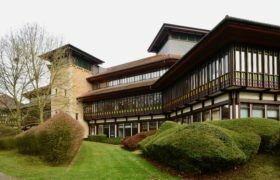 This is a chance to get up onto the roof scaffolding and to discuss the repair issues with the architect, concrete craftsman and Historic England. We will meet at 11:00 at St Thomas More, 130 Horse Shoes Lane, Sheldon, B26 3HU. At 12:00 we will go on to Our Lady Help of Christians, 57E Meadway, Tile Cross, B33 0AU. We can car share between the sites if anyone needs a lift. The tour will end at around 13:30. The tours will be led by Katriona Byrne, with Cristina Gardiner and James Phillips. Capacity is approximately 25. There is limited space on the roof of the church at Kitts Green so we will be divided up into groups to go up on the scaffolding. Hard hats and sturdy and/or steel-toed boots will be required to go on the roof. There will be a few spare hats. The cost will be £5 for members and £10 for non-members.